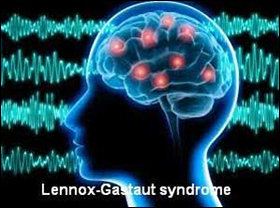 Lennox-Gastaut Syndrome (LGS) or West syndrome is a rare and severe childhood form of epilepsy. There are several different kinds of seizures which makes the condition hard to manage and treat. Seizures that start in infancy are called Infantile Spasms or West's syndrome. It is characterized by involuntary contractions of the head, neck and trunk. LGS is characterized by multiple seizures with abnormal EEG (electroencephalography) and cognitive, behavioral and psychiatric symptoms. The onset of LGS is in infancy and early childhood (age 2 and 6) wherein the seizures occur almost daily leading to psychomotor retardation. Children with LGS often show symptoms of delayed learning and achieving milestones like sitting, crawling, walking, social interaction which eventually weakens the quality of life. LGS affects slightly more males than females. The cause of LGS is still not known, it can be caused by a variety of underlying conditions like lack of oxygen during birth time (prenatal hypoxia) and abnormal development of brain cortex. Genetics also plays a role in getting this disorder. Brain injuries during pregnancy or any kind of brain infections (rubella, meningitis, encephalitis) could be a reason to develop LGS. A brain problem where in some nerve fibers in the brain don’t line up right during the development of the child in womb is also linked to LGS. This is called cortical dysplasia. Another cause could be Tuberous Sclerosis wherein non-cancerous tumors form in the brain and lead to LGS. The key is to help the child with the best quality of life while facing the challenges and stress associated with LGS. Emotional support is needed at all time. When there is an identifiable cause, those cases are referred to as symptomatic LGS. In the cases the cause is unknown and cannot be determined after evaluation, it is referred to as Cryptogenic case. The symptoms of LGS usually begin during infancy or childhood. Affected children experience several types of seizures like Atonic, Tonic and Atypical absence seizures. As the affected individual grows older, the types and frequency of seizure activity changes. Sudden loss of muscle tone and limpness. It causes head to drop or nod and even sudden falls. They are called "drop attacks" and can lead to injuries of head and face. It lasts for few seconds and partially affect consciousness. The muscles may jerk. Increases muscle tone and muscle stiffness. It can be characterized with brief interruption of breathing, muscle spasms of face and extension of arms and legs. Tonic seizure lasts for a minute and happen mostly during sleep. If tonic seizure happens during day, it may cause the individual to fall. They are also called "drop attacks". A period of unconsciousness marked by unresponsive staring and the affected individual has no memory of what happened at all. They last for a couple of seconds and may go unnoticed. A person may have a blank stare, or nod their head or blink quickly. The LGS is diagnosed based on thorough clinical evaluation, medical history of the patient is taken and a complete physical and neurological evaluation is done by MRI and EEG. The affected person shows spike and wave pattern. LGS can be difficult to treat because it is resistant to many kinds of antiseizure medications. 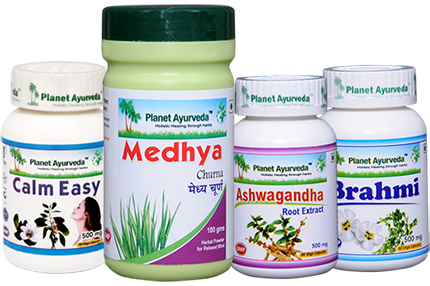 Planet Ayurveda offers a reliable treatment for LGS in the form of four highly effective medicines. These products are 100 percent natural and safe to be used as there are no known side effects for them. The product is formulated from standardized extract of roots of Ashwagandha (Withania Somnifera). The medicine shows excellent results in treating stress, anxiety, muscle fatigue, neck and back stiffness, depression, fatigue, joint pains. It is highly beneficial in cases of waning memory and all kinds of nervous disorders. The products help to build up stamina. Ashwagandha is known to balance Vata in the body, which is primarily responsible for all kinds of body movements. It is a great mind boosting supplement. Dosage: The recommended dosage for Ashwagandha capsules in treating LGS is 1 capsule two times a day with plain water preferably after meals. The product is formulated using high quality extract of potent Brahmi Plant (Bacopa Monnieri). The medicine has positive effects on brain cells. The product is known to influence regeneration of brain cells in a to positive manner. The product is useful in treating hypoglycemia in infants and neonates. The medicine has anti-allergic properties and are very useful in treating any kinds of swellings in the body. Dosage: The recommended dosage for Brahmi capsules in treating LGS is 2 capsules two times a day with plain water for adults, while 1 capsule a day for children. As the name suggests, the product is formulated to calm the mind and relieve stress naturally. It deals with all conditions like nervous breakdown, anxiety, depressions. It is a combination of memory enhancing herbs like Brahmi, Ashwagandha and Tagar. These capsules act as a nervine tonic and boosts the individual's stamina. It improves memory, increasing concentration and learning capacity and also nourishes the neurons. Dosage: The recommended dosage for Calm Easy capsules in treating LGS is 1 capsule two times a day with plain water. The product is a great memory booster and stress reliever. Medhya Churna helps to balance the body's three vital energies of Vata Pitta and Kapha. The churna is prepared using herbs like Vacha, Ashwagandha, Brahmi, Ajmoda, Sonth, Shankhpushpi, Pipali, Marich etc. The product rejuvenates the nervous system. Dosage: The recommended dosage for Medhya Churana in treating LGS is half spoon two times a day with plain water. 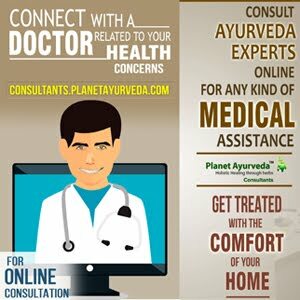 All products by Planet Ayurveda are prepared under supervision of expert doctors, in a clean, closed, germfree environment. All products are free from any kind of chemicals, additives and preservatives, binders or fillers. A high fat, low carbohydrate diet that makes the body burn fat for energy instead of glucose is recommended. Other options of treatment includes therapies like VNS (Vague Nerve Stimulation) and other surgical techniques if the individual do not respond to medications at all.